To say that the Syrian Civil War has changed the fabric of the greater Aleppo metro area would be an understatement, yet one aspect of it that should receive more attention is the growing influence and evolving status of Aleppo’s Palestinians within Syrian loyalist society. Granted, Russian influence over the Liwa al Quds militia from Aleppo became the subject of discussion in 20161.“Russian influence evident in Palestinian militia in Syria” : Long War Journal after its role in combat operations in East Aleppo. But because of the way Syrian loyalist society is structured, battlefield success alone is no guarantee for networks and communities to be elevated within Syrian society. 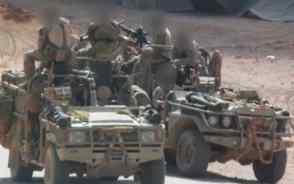 For example, despite successfully holding their areas at the front line with Idlib, the Hama National Defence Forces (NDF) remain relatively unknown, for now. By comparison, the Qomhana–based Tiger Forces, another group whose home community was almost completely overrun in the last major Hama offensive, remain well regarded. Unlike other groups similar to the Hama based NDF previously mentioned, Palestinian armed groups have generally seen a rise in visibility and standing. Part of this is due to their larger size and willingness to deploy hundreds of kilometres away from their core areas to places like the deserts of Eastern Syria2.Photo of Liwa al Quds fighters in Deir ez-Zor : Liwa al Quds Facebook page. The Palestine Liberation Army (PLA), supported by Russian advisers, has deployed sizeable units under the command of its flag rank officers to Eastern Hama away from Palestinian communities 3.https://goo.gl/uWnQ1Ato fight against the local Islamic State (IS) pocket. The PLA as an organisation dates back to the formation of the armed wing of the PLO in 1964. In Syria, the PLA is made up of several units including numbered battalions and what are called recon forces. While this Syrian branch of the PLA still wear uniforms sporting distinct Palestinian insignia, they were considered even before the war as tied to the Syrian Arab Army and have remained so. 4. https://scontent.fsof2-1.fna.fbcdn.net/v/t31.0-8/23737613_162076034391851_770590076091395954_o.jpg?oh=e5a2c77ee1d80fd38d3519f2fe6c4fd4&oe=5AF6A8CA 5. https://scontent.fsof2-1.fna.fbcdn.net/v/t1.0-9/23621289_162076067725181_7724472441781090747_n.jpg?oh=c853b98772199392a00c3534694c752e&oe=5AF3DC7C As part of this deployment, significant efforts were made to further cement links between Damascus and the pro-Assad Palestinian groups. Russia has also spent some effort on fostering links with the Palestinian militias, as evidenced by Russian Chief of Staff Valery Gerasimov’s visit6.facebook.com/…6655437528/1471995352881317 : Liwa al Quds Facebook page to the commander of the Liwa al Quds. Something better-informed readers will take note of is that the two are accompanied by the local intelligence branch’s Brigadier General, whose presence suggests that the event is significant to a lot more of the local of the factions and organisations in both Aleppo and Syria as a whole. The intelligence branches themselves to this day retain a considerable if subtle and at times almost completely ignored influence within Syria and the communities they oversee. Due to its status, the Palestine Liberation Army and its high command also gets airtime via interviews and reports about it on Syrian state TV, and of late this has been supplemented with better weaponry for their units. One of the most important benefits that helped elevate the Palestinians of Syria was a pre-existing one whose prominence grew as the war progressed. The United Nations Relief and Works Agency (UNRWA) assistance program, which has been ongoing for over 50 years, spent in 2016 a total of 1.36 billion USD based on their yearly financial overview of unaudited operational spending data.18.https://www.unrwa.org/sites/default/files/content/resources/2016_annual_operational_report_web.pdf : UNRWA Funding for Syria fell short of their targets, at 235 million USD being provided by donors out of a program-mandated 414 million. While the sum is not overtly large, given the scale of the overall economic downturn brought on by the war that is now in its 7th year, even this amount is considerable for Syria. Al – Nairab Camp News throughout the area as well as schools23.https://www.facebook.com/narab.sy1/posts/868678693294503 : Al – Nairab Camp News and clinics run24.https://www.unrwa.org/where-we-work/syria/neirab-camp : UNRWA whose operational expenses are covered by the UNRWA program. This has to be compared with the bleak career opportunities for Syrians in Aleppo, as the city remains largely without power25.https://www.nfac-sy.net/news/19125 and its sugar and textile industries that provided for it pre-war are now facing trouble even getting off the ground again. And in comparison the base income for registered Palestinians from UNRWA adds a considerable boost to their income to the point it’s somewhat comparable to Syrian state wages. Incentives also exist for Assad’s financial sector to help facilitate the agency’s disbursement of funds as the UNRWA program has no other choice but to buy SYP from the State as there are not a lot of entities with access to SYP in such quantities and it needs access to bank branches in Syria to reach recipients which again leads to pro-Assad entities as the financial sector remains under Damascus’ control. In essence, the financial aid that is paid out to registered Palestinians in Syria is a net USD surplus to Assad’s FX reserves due to the state-dominated banking system. A simple way to understand why this influx of foreign currency is important is to look at the goods that Syria is currently forced to import that include wheat, oil and even gas at times 26.http://alwatan.sy/archives/88898 but at the same time it no longer has products it can reliably export besides niche food items for expats living in Germany or other European countries.27.http://uk.businessinsider.com/r-made-in-syria-refugees-in-germany-drive-exports-from-home-2017-11 So that foreign currency coming into Syrian banks can be bought by the state using SYP and then be used to pay for these key imports. To dismiss allegations of pure favouritism on behalf of the agency, it must also be pointed out that this is a long-running program that had the same tasks of providing assistance, education and combating poverty in the Palestinian camps throughout the region, not just Syria. That being said, it also has to be understood that the program is quite open about its cooperation with Damascus. While it is a program that provides aid to struggling Palestinian communities to do so also means that it works within their established political networks and political alliances in the various countries — which in a conflict like Syria, has greater implications. As the war progresses, Western Aleppo’s prospects continue to fall short of Damascus’ promises, as can be seen from testimonials on the prices for using amps, this refers to power generators that people pay to provide their homes with electricity.28.https://www.facebook.com/AleppoNews.sy3/posts/1738741409753278 : Aleppo News However, the Palestinian minority in the eastern outskirts of the city appear to be gaining ground through a combination of military contributions, establishing liaison links with Russia and with the assistance provided by existing aid programs that now offer a substitute for the salaries and services that Damascus is struggling to provide. In some ways, the Palestinian community in Eastern Aleppo has grown into a state within the state; a city-state entity that seems more prosperous than its surroundings and cannot be easily dismantled, but also one that still needs the expanded infrastructure of Syria which remains under the control of Assad and his Baath-dominated state institutions.